It went about like I thought it would. We headed into last Friday’s game with the roster in flux–at least among the attackers. Doom and gloom appeared in the SpaceBook comments, as well as around the concourse prior to the game. But I told you to look out. I told you that a team with adversity–especially at home–will sometimes play harder and rise up to the occasion. I told you that the defense was intact and we our goalie is playing well and as long as we don’t fall behind early we’ve got a good chance and I like us to win. And I also told you that the big worry was to be the following night versus a red-hot Wilkes-Barre club on the road in a classic let-down game. It wasn’t rocket surgery. That’s exactly how it played out. We’ve seen that show before. Last Friday at the PPL Center the middling Belleville Senators arrived from the north country to challenge our Hamilton Street Heroes. They were met with a quality effort from first-year players like Carsen Twarynski, Connor Bunnaman, and Carter Hart who were all named to the “three stars.” The “Hart of Stone” performance could likely be his last at the PPL Center. The next night in the Wyoming Valley the special teams weren’t so special. 0-6 on the man advantage is never good. Given the roster changes, though, it wasn’t a complete surprise. What really hurt, though, were the shorties–a one-on-none breakaway and a two-on-none breakaway were both converted, along with an empty net, to get to 5-1 in a game which was really 2-1. It’s the kind of thing that happens with the roster changes and a couple games in a row. You’ll have this in a long season, and I expect it to improve. Notes: Again I stick with the winning percent–not to pump up the team but to reflect the games in hand. Hershey’s been dreadful. I fear the Phantoms are but a .500 team right now, but they’re probably a little better than that. Bridgeport is on the 3-0 run, but their last 10 look similar to the Phantoms, plus they’ve scored 4 fewer goals in three more games! Charlotte is really good. Hershey is not. Goalie Carter Hart has been called to the NHL level for the first time. He started last night in Philadelphia and got his first NHL win along with coach Scott Gordon. Read yesterday’s Phantoms Notebook for more on the recent upheaval with the Flyers. 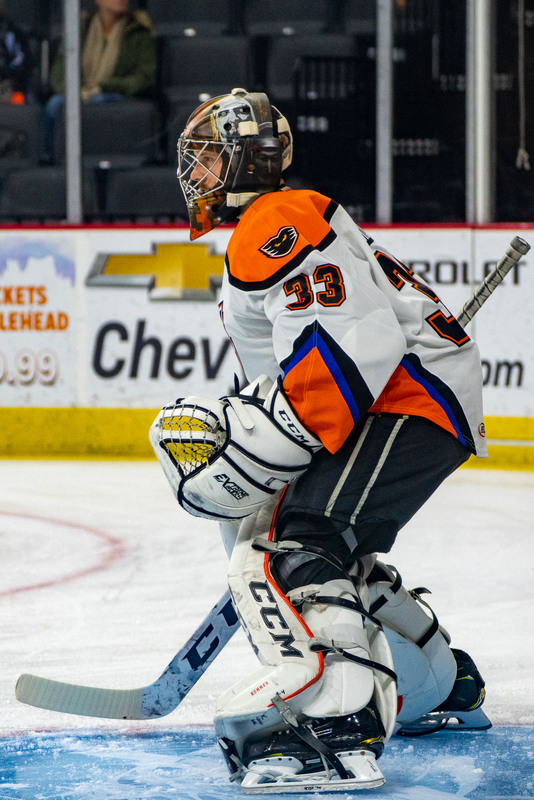 Goalie Alex Lyon has replaced him with the Phantoms, and should be backed up by Branden Komm, up from Reading last week. Let’s get that roar going tonight in the Lyon’s Den! Center Phil Varone remains with the Flyers, which I expect to continue. He’s well known by new coach Gordon, or course, and Lehtera has some legal trouble coming up perhaps, which should all lead to more playing time for Varone. 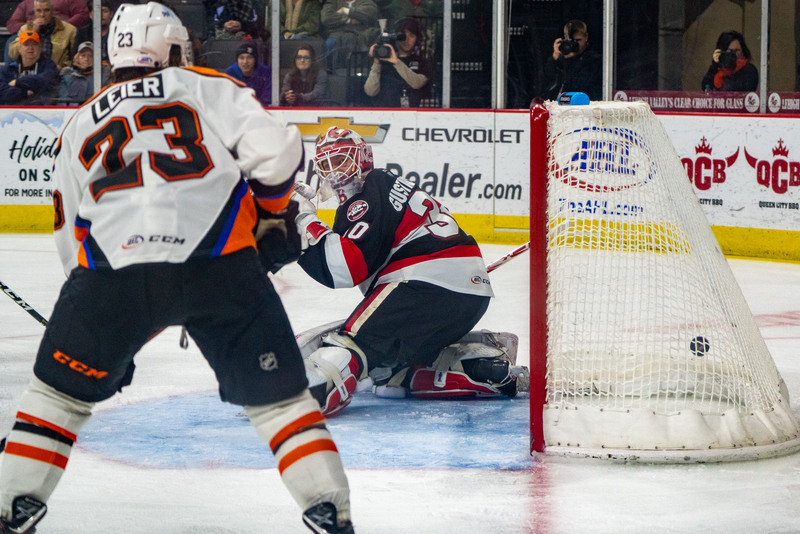 Editor’s Note: Varone is returning to the Phantoms today. Good job Kram. Move made in advance of roster freeze tonight 11:59PM and before waivers were required due to service time/games played. Center German Rubtsov is out for the year with what’s thought to be a shoulder and subsequent surgery. Center Misha Vorobyev has missed a couple games with injury. It’s not thought to be long term, but we’ve been given no more information. I’m assuming upper body because I do have reports of him skating. Winger David Kaše missed a game with injury, then two due to suspension. His health status is also unknown. Will new head coach Kerry Huffman be more forthcoming with injury information? What about the new GM in Philly? We’ll see. Forward Cole Bardreau has also missed some time with injury recently. Inside information obtained by The Horn and Bell Blog leads me to believe it could be a while before we see him again. Forward Radel Fazleev is leaving the team, it seems. More below. Forwards Mike Huntebrinker and Alex Krushelnyski are still in town. Neither flashed in the two games last weekend; however, as they continue to get integrated into the lineup and the “systems” we’ll look forward to more contributions. Both are more than capable of playing with this club. Steve Swavely was added today on PTO. With the Fazleev move and given that Varone played last night in Philly this is a sign that the injured guys won’t be back, and perhaps Varone won’t be available to play. The Royals are currently second in their division with a record of 13-7-2-4. However, with the loss of Huntebrinker and Krushelnyski–in addition to all of their goalies including Komm–they are facing some adversity at this point in the season as well. Still, they’ve managed a 6-0 streak right now and are 7-3 in their last 10. Get yourself down to Reading to support them if you have the chance. Wednesday night is for the hockey fans, and the Hershey Bears return to town to take on your Lehigh Valley Phantoms. The lowly Bears are on a 0-3-1 streak and are 3-6-1 in their last 10. Still, the Phantoms will need to mind their game tonight for “new” coach Kerry Huffman to get of to a good start like the Flyers did last night for Coach Gordon. Lyon: The Lyon King is back in town and it’s his net. He got switched out for Carter, and if I were him I’d have a chip on my shoulder. Add in the injury proclivity of the Flyers goalie stable and he still has an opportunity to earn his way back to the NHL. It starts tonight. Roar. Third Line: Not just Twarynski’s goals last Friday, but I thought Fazleev played one of his better games as a Phantom the other night. They didn’t get on the sheet on Saturday in Wyoming Valley, but watch them tonight and see if they can continue to step up. With the loss of the scorer Varone and the playmaker Misha and the spark-plug Kaše, we need some juice. These guys have already shown that they can do it–now let’s see if they can do it consistently. Then, just as I’m proof-reading, I learn that Fazleev is leaving the Phantoms, perhaps to return to Russia or for a European opportunity. We wish him well. Special Teams: It’s been too hard for me to keep up with the exact personnel on the power play units, but given both the loss of man-power and the change in head coach, let’s see what the man-advantage looks like tonight. Can they protect against shorties? 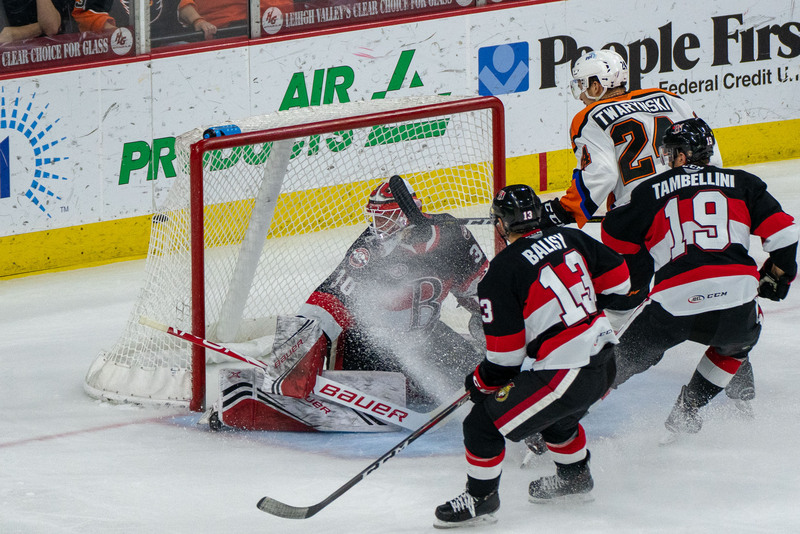 Second Line: Vecc got the goal in Scranton, but I’m still looking for more from Taylor Leier on the score sheet. If the youngsters aren’t stepping up, these guys are the ones who need to contribute in the box score. Colin McDonald: I saw the Captain catching some guff on the message boards. Take a look at his game tonight, but also keep in mind that he’s playing on the fourth line along with the guys fresh up from Reading. His role may be a bit different than it was in previous years in terms of leading the new guys along and being responsible defensively. See what you think. And see if it looks different if the Captain is added to a higher line tonight given the continued roster machinations. We’re right back here on Friday for North Division powerhouse Syracuse. This will be our first look at the Crunch this season. Our week will conclude on Saturday in Hershey. Next week begins with a Boxing Day special up at Casey Plaza (7:05 start).